The symbol of the Legion XIV Elite™ is designed after elements of the standard of Legio XIV, the fourteenth Roman Legion, who were undefeated, respected and feared. The wings of the eagle represent power and strength, and the thunderbolt was the weapon of the Roman god, Jupiter. Legio XIV fought under Caesar, Claudius, Marcus Aurelius, and other notable emperors of Rome. Nero even believed them to be the best legion that he had. 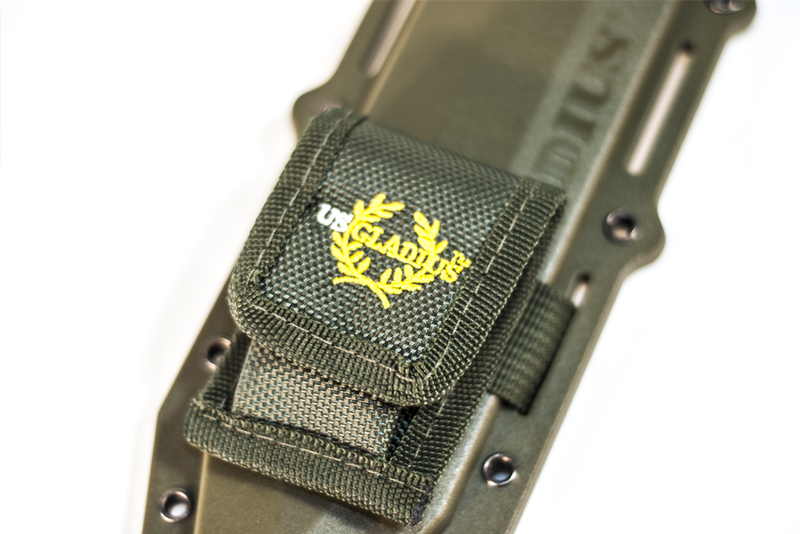 This is currently the largest knife in the USGladius® line, measuring 14” in length overall. The Legion XIV Elite™ comes with a double edged full tang titanium-coated stainless steel blade. This knife features removable handle scales for reduced weight, easy cleaning, throwing, survival applications or to use with a lanyard. California, Massachusetts or New York. Note: When seating the knife in the sheath, tilt tip of blade slightly forward to clear the compression tab, which is located on the back wall of the sheath. The compression tab is designed to hold the knife securely in the sheath. Campaigns in Germany under Marcus Aurelius, depicted in the movie "Gladiator"